This is a scalable context timeline. It contains events related to the event July 16, 2009: Conservative Pundit: ‘Affirmative Action’ Latina Judge Should Not Be Confirmed to US Supreme Court Because America Is ‘a Country Built Basically by White Folks’. You can narrow or broaden the context of this timeline by adjusting the zoom level. The lower the scale, the more relevant the items on average will be, while the higher the scale, the less relevant the items, on average, will be. 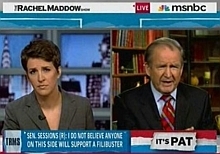 Rachel Maddow and Pat Buchanan, during their discussion of Sonia Sotomayor’s nomination to the Supreme Court. [Source: MSNBC / Crooks and Liars]As the Senate readies to vote for or against Judge Sonia Sotomayor for the Supreme Court (see August 6, 2009), conservative commentator and author Pat Buchanan attempts to explain why he feels Sotomayor should not be confirmed.